The 137th episode of THE FIRE AND WATER PODCAST is now available for your listening pleasure! THE FIRE AND WATER PODCAST is the official podcast of FIRESTORM FAN and THE AQUAMAN SHRINE. This week Shag and Rob take a look at some classic Aquaman and Firestorm adventures! First up, “The Pirate Who Plundered Atlantis” by Paul Levitz, David Michelinie, and Jim Aparo, from Adventure Comics #441 (Oct. 1975). 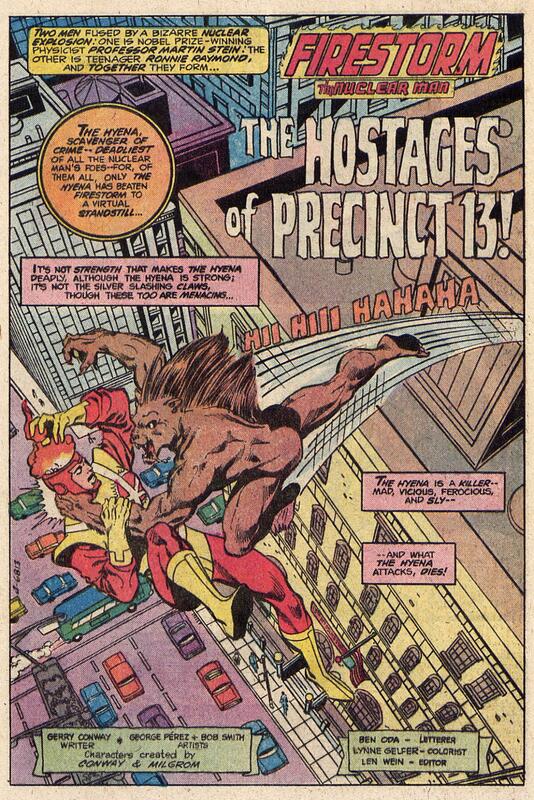 That’s followed by “The Hyena Laughs Last” by Gerry Conway, George Perez, Bob Smith, John Costanza, and Lynn Gelfer, from The Flash #291 (Nov. 1980) and “The Hostages of Precinct 13″, by Conway, Perez, Smith, Gelfer, and Ben Oda, from The Flash #292 (Dec. 1980)! You can find the 137th episode of THE FIRE AND WATER PODCAST on iTunes. While you’re there, please drop us a review on the iTunes page. Every comment helps! Alternatively, you may play the podcast using the player below or by right-clicking “download”, choosing “Save Target/Link As”, and selecting a location on your computer to save the file (47 MB). And as for this backup (or short story?) series, keep it coming! Fun stuff, guys. Okay, here are my suggestions for the Backup Feature Name. First is Aquaman-related: BACK STROKES! Second, Firestorm-related: BACK DRAFTS! I see now that I suggested a name for each characters’ backup feature, so I think you could just combine them and call the feature BACK STROKES AND BACK DRAFTS! (exclamation point optional of course). I also realize that your recent reviews were not actually back ups but “front ups” as Rob called them. Sooooo, does that make my initial suggestions moot now? I dunno. I leave that to you to decide. I’ll try to think of a new one if I can but I’m so damn pleased with this that I might just walk away; my work is done here. Also, I love both Rob’s and Shag’s enthusiasm over these short stories in this episode – and their snark while poking fun at each other’s fave character and the stories in these issues – was a real hoot. It’s why we all enjoy this podcast so much. You guys bring the joy, week after week. Wow, the two of you teaming up to do an Aquaman and Firestorm podcast. Who woulda thunk it? I’m telling you, this is going to revolutionize the comic podcasting world. I’m not sure how much you can milk out of this, but I’m willing to give it a go. These sound like fun comics. To me, Aquaman should be fighting guys in pirate costumes. It’s just natural. Man, I love how Aparo draws Aquaman’s hair underwater, with that incredibly long strand of hair flopping around as he swims. Aparo uses it like Batman’s cape to show movement. It defies the laws of physics, because Arthur would have to have a Flock of Seagulls-like set of bangs to make that work, but I don’t care…it’s all kinds of awesome. I think I first met Firestorm in the first part of the JLA/JSA/New Gods story you guys mentioned, and then found him hanging out in the back of the Flash. I started picking up Flash when Infantino came back. I think Broderick was already on it by then, so I missed out on Perez. Even at age 5, I knew Perez was the bee’s knees. Great Batgirl stinger at the end. Very saddened by the passing of one of my childhood crushes, Yvonne Craig. And I know I’m not along amongst our fanboy brotherhood. RIP. Yvonne Craig’s death actually depressed me last week, the day I heard. I knew how important she was to my young geek self (first pop culture crush, most likely), but I’d not realized how important she still was to my older geek self. My friend and I spent the day texting about it, just how cool she was on the show as both Batgirl and Babs, plus how that costume was so damn iconic (and still likely my favorite live action superhero costume ever). RIP Yvonne. You ruined a lot of us young geeks, in the best way possible. I don’t recall my original submission but I think these episodes should be ‘You Called For Back-Up’. You can even co-opt Peter Weller saying it as Robocop! I’ll take a were-hyena 1000 times over a padded hyena suit with vibro-claws. I do like that it is Summer Day who is painting the town red with blood. Adds a nice wrinkle to the dynamics of the book. This is the first time that I have seen the Aquaman story but Capt. Demo does indeed look like he should be singing ‘Give me back my file o fish’. Aparo can make anything look great though.